❯❯ 1 set has students measuring their own body parts. ❯❯ 1 set requires students to measure objects on cards. ❯❯ 1 set requires students to draw lines measuring in inches. ❯❯ 1 set requires students to draw lines measuring in centimeters. ❯❯ 1 set requires students to draw lines measuring in inches and centimeters to see comparison. 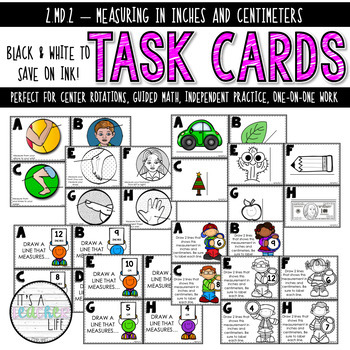 ♥ Recording sheets are provided for each set of task cards. ♥ Answer keys are NOT provided for each set of task cards due to the fact this standard is more complex than a "the answer is 8" type of answer. Feedback is greatly appreciated and valuable! Not only does feedback help me, but you earn credits toward free product as well! Please be sure to leave feedback after your purchase! Please do not leave negative feedback for minor mistakes. If you send me a Q&A or email me (itsateacherslife@gmail.com), I will gladly fix any mistakes & ensure you have a great product. Remember.. no one is perfect!